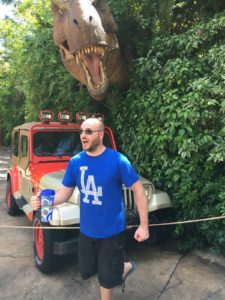 Home The Team Nate A.
I am a cabinet maker/woodworker and a big Dodgers fan. I also enjoy movies and video games. My whole life, I’ve always loved ghost stories and have been fascinated by the paranormal. When watching the TV show Ghost Hunters, I wished for a long time that I could do what they did. Paranormal investigating is great, because I love exploring and I love the darkness. I really enjoy telling people about my ghost hunting experiences and having them listen to my EVPs. I am married to the best woman any guy could ask for and we have 3 crazy cats. Oh and I’m a dinosaur wrangler.